The idea of obtaining a drug from a genetically modified (GM) animal seems almost far-fetched to some people, particularly when there is so much controversy around basic GM crops and farming practices. Yet a potentially important medicine to come from a GM animal has now been suggested for use in Europe. While a previous decision recommended the drug not receive a license, this has recently changed following new advice from experts. 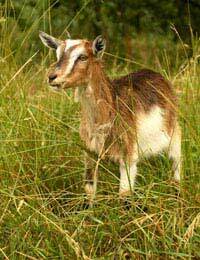 The drug is known as ATryn and is one of many medicines of the future that will be produced by goats. The goats are modified to have a human gene that plays a role in preventing blood clots. The aim is to use ATryn during surgical procedures on patients who are known to have a rare medical condition that causes their blood to clot more easily than normal. These people are born with the condition, which stems from one copy too little of an important gene that produces the anti-thrombin protein that prevents blood coagulation. If you or someone you know has this condition, you are likely familiar with the standard treatment known as Warfarin. This is a blood thinner that helps to 'protect' the patient. But if the patient is going to undergo an intensive surgery that is considered high-risk, they receive anti-thrombin, which has traditionally been removed from human blood plasma. A key issue with human blood plasma, however, is that disease could be transmitted. For this reason, there is fear of a patient having exposure to human blood plasma, despite it being important during the surgery. By producing anti-thrombin in animals, the supply will be free of diseases and there won't be the subsequent concern of patient exposure to disease. A company based in the United States has taken control of the problem by commencing production of the human anti-thrombin in animals. The original denial of the request was that there wasn't enough scientific data presented to attest to the safety of the GM anti-thrombin. But now that data has been subject to be examined again and expert opinions have been added to the mix, the drug has been approved for use in Europe, although this is still needing to be approved more finally in the next year. The costs of the treatment also could be more economical and the production much greater than traditional anti-thrombin. It's a way to get the treatment out there in vast quantities for patients who need it. There is still much controversy around GM foods and this new field of GM medicines is similarly a controversial one. Some people see it as 'messing' with nature and they don't support the notion of producing drugs from animals. But those who support it see it as a lifeline for providing better treatments and care for patients. Despite the debate, it does seem that GM foods are here to stay and the newer arena of GM medicines will continue to grow. How do They Test GM Foods? what if gmos are actually gmod mods in disguise?!!?! ?